Floor Area : 2,026 sq.ft. EXCELLENT OPPORTUNITY for builders, investors to hold & build their dream home. Plans have been completed & almost through city planning dept. Building permits should be issued in Feb 2016. Currently rented out for $4300.00. This 38×122 lot is located on a quiet pretty tree lined street w/ lane access. Just over 2000SF this home offers: A bright floor plan with 5 bedrooms, renovated kitchen with S/S appliances, updated bathrooms, wood burning & gas F/P. French doors off family room to a large patio w/ a private backyard. A unique second level w/ vaulted ceilings & skylights, plus a spacious covered deck (327SF). 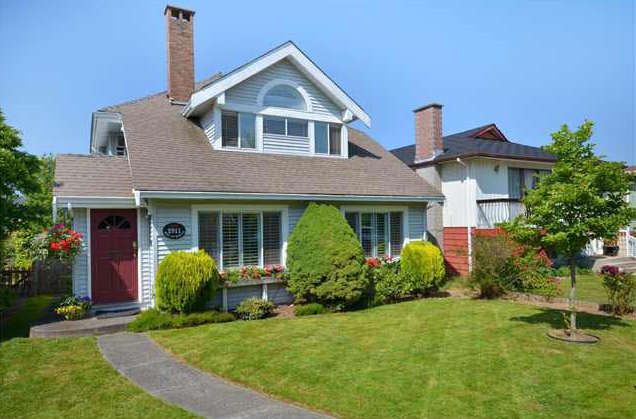 Walking distance to Trafalgar Elementary, Prince of Wales Secondary & close to St. George’s, West Point Grey & UBC. Close to transit, park & shopping.